The LEDP3W-3-M LED Light Bar offers high light output from a compact form factor and is ideal for a wide range of uses including heavy equipment, boating, vehicle, military, law enforcement and industrial manufacturing applications. 684 lumen light output with very low amp draw, 50,000 hour service life and 9 to 32 volt compatibility provides operators with a compact and powerful LED lighting solution. The LEDP3W-3-M LED light bar from Larson Electronics produces 684 lumens of bright light while drawing only 9 watts @.8 amps from a 12 volt electrical system. Three CREE XLamp XR-E® three watt LEDs producing 228 lumens each are paired with high purity optics to produce a tightly focused 10 degree spot beam approximately 375’ long. We also offer optional floodlight versions with a 40 degree beam spread to provide more light over a larger area nearer the fixture, making flood versions ideal for use as work and area lights. These LED light bars are waterproof to 3 meters, sealed against intrusion by dust and dirt and very ruggedly constructed to withstand the most demanding environments, conditions and applications. An integral Pulse Width Modulation controller, small profile, low power requirements, high durability and versatile mounting system makes these LED light emitters a superior lighting solution for a wide array of applications including but not limited to: military, industrial manufacturing, machine visioning, security and law enforcement, boating, offroading and commercial structure illumination. 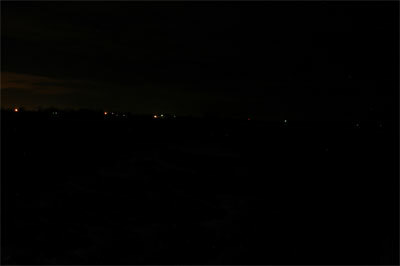 This photo shows an open field illuminated only by ambient light at approximately 9:00 pm`. This photo shows the LEDP3W-3-M in spot configuration, illuminating a `Larson Electronics` sign set approx. 600 feet away. 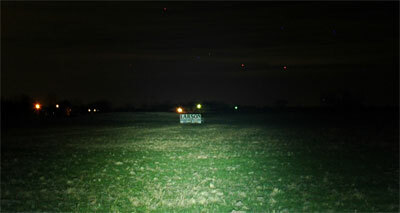 This photo shows the LEDP3W-3-M illuminating the sign approx. 600 feet away. In spot mode, the LED unit projects a long, narrow beam, capable of reaching out over 600`. Heat Management: Heat is the single largest factor in premature LED failure and color shifting. These LED units contain advanced drivers which use pulse width modulation to control heat buildup rather than simple voltage regulators which are typically harsh on sensitive electronics and can contribute to early LED failure. These units automatically sense the temperature of each LED and adjust the energy frequency or “duty cycle” accordingly to maintain heat levels within acceptable ranges. This system in essence flashes current at an extremely fast on and off rate to each LED based upon the LED’s core temperature. This flash rate is too fast to detect with the human eye, but provides precise control of the current flowing to each LED and thus the heat it generates. This allows the LEDs to be driven at up to 100% capacity without overheating or visible loss of light output. The LEDs are always driven at the same voltage but the duty cycle, however, is changed to alter how long the LEDs are actually on or off. 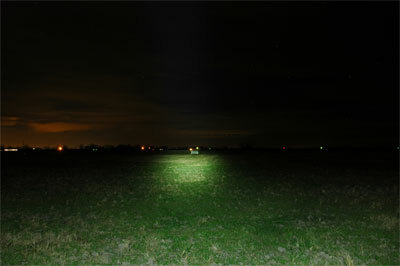 The end result is more light with less heat and longer LED life with an average 70% lumen maintenance after 50,000 hours. PWM Control: The pulse width modulation drivers in this unit also provide secondary benefits through the ability to tap into a provided input wire with an external pulse generator and adjust the duty cycle of the current being applied to the LEDs. Thus you can connect an external dimmer, switch or pulse control and adjust the perceived output of the light, effectively causing the light to flash, dim or brighten to the desired levels. Additionally, this method of controlling light output results in a corresponding drop in amperage draw, so if the duty cycle is cut back to 50% there will be a matching 50% reduction in amperage draw. These units are also able to monitor and adjust input current to maintain the correct LED voltage levels regardless of input levels across a specific range. These LEDP3W series light bars can operate on current ranging from 9 to 46VDC without any modifications necessary as a result. This ability to sense and adjust input current also provides protection against voltage spikes and drops that can occur in vehicle electrical systems which would otherwise result in burning up or premature LED failure without it. Durability: As well as unparalleled heat control, the LEDP3W series of LED light bars from Larson Electronics also offer IP68 rated construction that is designed to withstand extremes of environmental and operating conditions. These units can withstand rapid temperature changes of -40 degrees Celsius to 85 degrees Celsius, are waterproof to three meters and resist ingress of dust, dirt and humidity. The housings are formed from extruded aluminum and the lenses are unbreakable polycarbonate. The CREE XLamp XR-E® LEDs offer resistance to shocks and vibrations and are rated at 70% lumen maintenance after 50,0000 hours of use. We recommend these LED lights for high humidity climates, very cold areas and rough saltwater conditions. They are also applicable to environments where equipment is used in one temperature extreme and stored in another temperature extreme. Mounting: Each unit is equipped with a 200 pound magnetic base for temporary placement. It is not recommended to be left on a moving vehicle. For increased adjustability please see our trunnion mounted versions which add a wider degree of vertical angle adjustment.